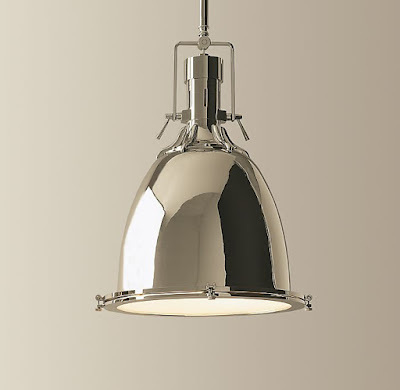 I think we may have settled on a pendant light (well, two actually - one for each end of the barstool area). For the first time, we actually agreed on a style. Now I am struggling a bit with the finish options (it you are curious, check out the link. Unfortunately, they only show you swatches and not the actual light). I think I am leaning towards one of the silver finishes because I feel like it'll look more polished. But I do like the dark brass finish as well. We haven't nailed down finishes for faucets or hardware... This may influence that though. Oh! And I decided while the plumbers were at the house last weekend running pipes to also run a cold line to the stove area so we can put in a pot filler! That way we don't have walk from one end of the kitchen to the other carrying a pot filled with water. Unless we need to dump it. That's another story. I like the pendant light you picked. Very cool! My friend has a pot filler...she really likes it...I know she uses it for pasta all the time. I lean toward a warmer brown color for your lighting and fixtures because of your saltillo and warmer cabinets. It would probably resale better too. BUT this is solely my opinion...I like the silver too...don't get me wrong! Good choice on the pendant! I am very very jealous that you are getting a pot filler!! Our kitchen is tiny so really no need for one, but still. :) I recommend trying to pick out the faucets and hardware b/c that will likely help you with the pendant light choice.